Formally established in 2017, Jubilee Community Benefit Society is a Christian and cooperative creation care organisation working for the benefit of a geographical community of all backgrounds and beliefs – the town of Larne and the surrounding area of East and South Antrim – and a community of interest – the churches of Ireland. We define creation care as environmental and agricultural stewardship that incorporates flourishing and fairness, welfare and wellbeing. In seeking to implement this holistic vision, our mission is to practice and promote care farming, community-supported agriculture (CSA), and conservation education and engagement. Visit www.jubilee.coop for more information. In purchasing and developing Jubilee Farm, the first community-owned farm in Northern Ireland, we aim to produce a range of high-quality, certified-organic food that is healthy, humane, fair, and sustainable while also providing a series of care farming, conservation education, and engagement services that inspire, inform, and benefit those who take part in them. 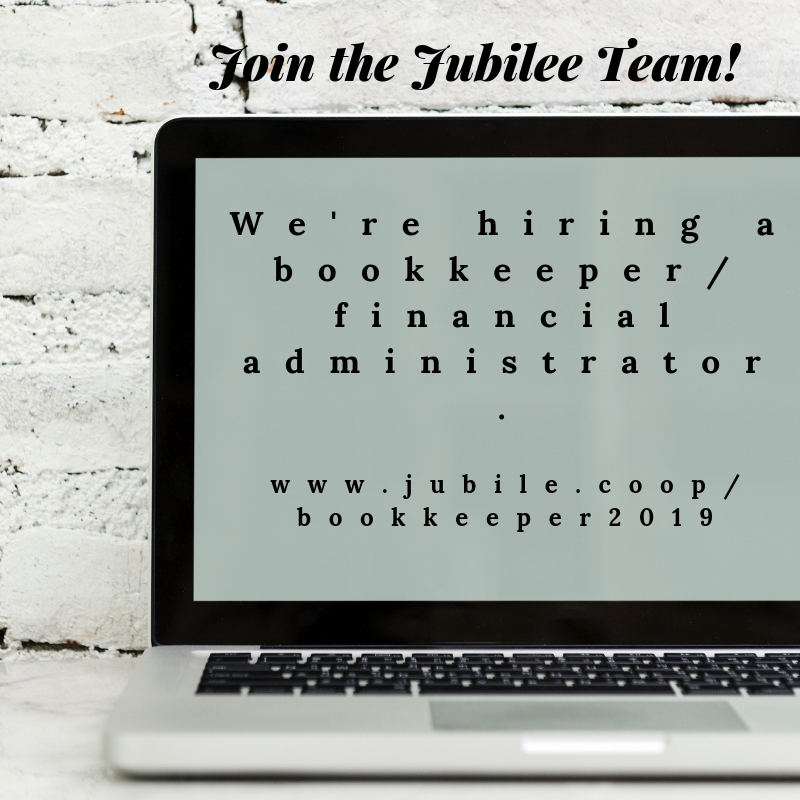 The bookkeeper/financial administrator will be responsible for the bookeeping and day-to-day financial administration that will keep Jubilee Community Benefit Society running from the inside out. They will work alongside the Managing Director as well as other Directors, staff and volunteers within the organisation. The role will be part-time one day a week (Wednesdays). General bookkeeping/financial administration duties, including the creation and maintenance of accurate day-to-day financial records via our bookkeeping software (Quickbooks). Creating, disseminating and tracking invoices for the Society’s goods and services, and tracking and coordinating bill payments. Setting and monitoring weekly financial administration tasks for office volunteers. Liaising with the Society’s Managing Director, Treasurer and Finance sub-committee to provide them with accurate financial data for management and annual accounts. Bookkeeping or financial administration qualification. Two years professional experience as a bookkeeper/financial administrator. Experience of working with bookkeeping software. Ability to work on own initiative and as part of a small team. Willingness to work within Jubilee’s Christian ethos. Experience of working with agricultural, environmental or community topics and themes. Please send a 2-page CV as well as 1-page covering letter to mail@jubilee.coop detailing how you meet the requirements of the role and why you are interested in the role by 5:00pm by 30th April 2019. The CV must include the details of 2 referees, including your current or most recent employer. Interviews will be held in early May.